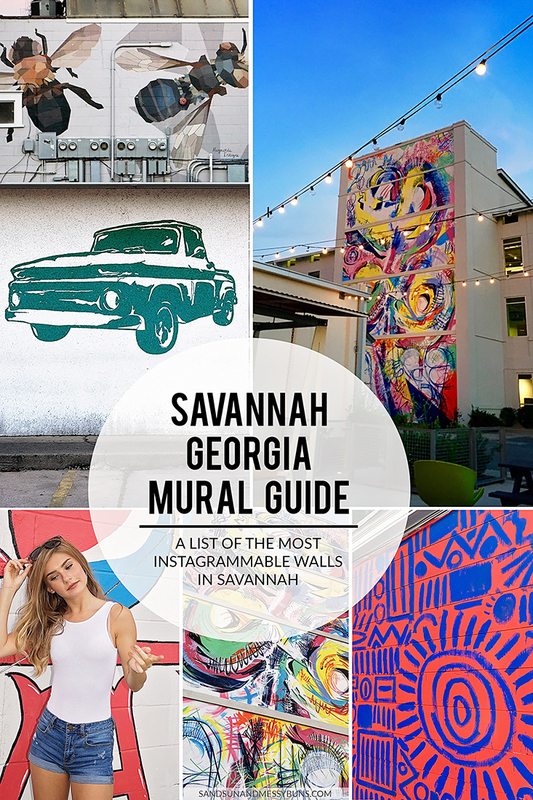 Even though Savannah is better known for having cobblestone streets than spray painted walls, there ARE colorful murals to be found — if you know where to look! We tracked down the most well-known options and included a few hidden gems that are slightly off the beaten path. Prepare to venture beyond the Historic District for this little scavenger hunt, because the most Instagrammable murals in Savannah aren't located within (comfortable) walking distance of River Street. Since I write from the viewpoint of a solo female traveler, I always try to include safety tips whenever relevant. I've made note below of any areas where you should be extra cautious of your surroundings. For the most part, you should be safe alone at any of these murals as long as you go during the daylight hours! Click on any photo to view it larger and read additional details. 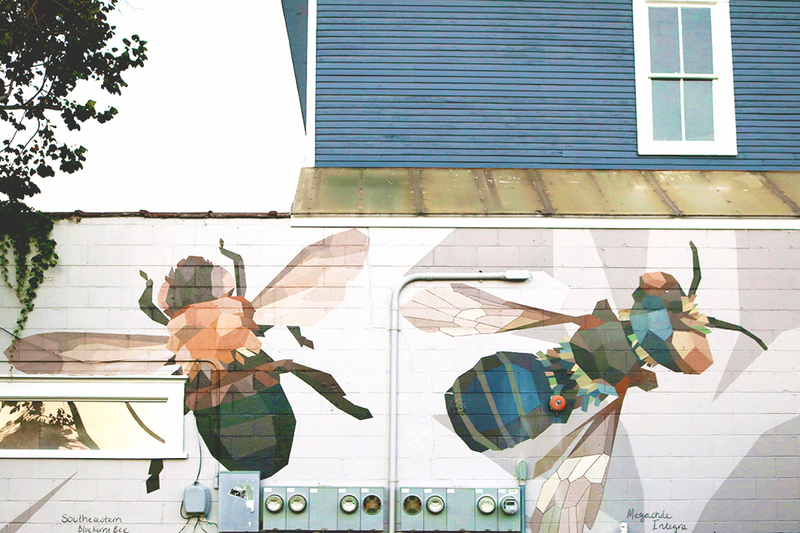 Georgia Bees Mural | 12 W 41st Street, Savannah, GA 31401 – Roaming artist Mary Lacy transformed a blank wall into a mural of four bees in the trendy Starland District near Midtown, Savannah. Each bee consists of a mosaic of geometric shapes painted in muted earth tones. The result is stunningly beautiful! The neighborhood came together to create the mural, and kids even got in on the act! You can watch the process in this video. Gotta love community spirit! It would be fantastic if this could become an annual event in Savannah to help beautify some of the more downtrodden commercial buildings. 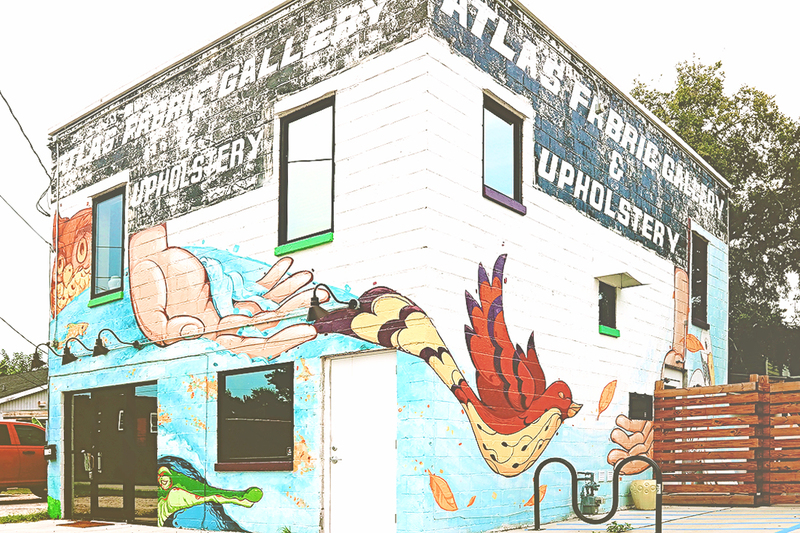 The mural is located on the side wall of Two Tides Brewing Co. and can best be seen from Whitaker & 41st Streets. Parking should be easy to find since there's nary a meter in sight. While you're in the area, be sure to stop by Back in the Day Bakery for a bite to eat, then browse through the goodies in Graveface Records & Curiosities, Gypsy World, and House of Strut. True bee fanatics should head to Broughton Street afterwards to sample some award-winning honey from the Savannah Bee Co. NOTE: This mural is in a pretty safe area, just be sure to lock your car when you get out. It often has food trucks and/or cars blocking it. 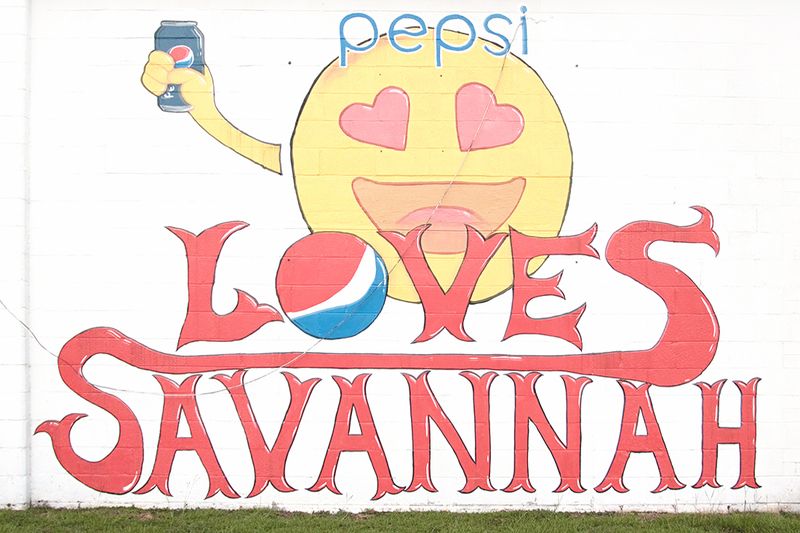 Pepsi Loves Savannah | 4009 Montgomery St, Savannah, GA 31405 – This happy little mural is a personal favorite in Savannah! You can find it at the Pepsi Bottling Plant. Parking is somewhat scarce for this particular building, but there are businesses nearby where you can park. The Pepsi mural is within walking distance to the next option on our list, so you may want to hit both up at once. NOTE: This area is perfectly safe during the day and is next door to a SCAD property, which means SCAD security patrols the area. I still suggest locking your car while you're busy snapping selfies. The bottom photos were taken mid-day and the top was taken at dusk. Montgomery Hall | 3515 Montgomery Street, Savannah, GA 31405 – Montgomery Hall is a Savannah College of Art & Design [SCAD] property, so public access isn't guaranteed. Currently the entry isn't gated, but don't be surprised if SCAD closes it off at some point in the future. 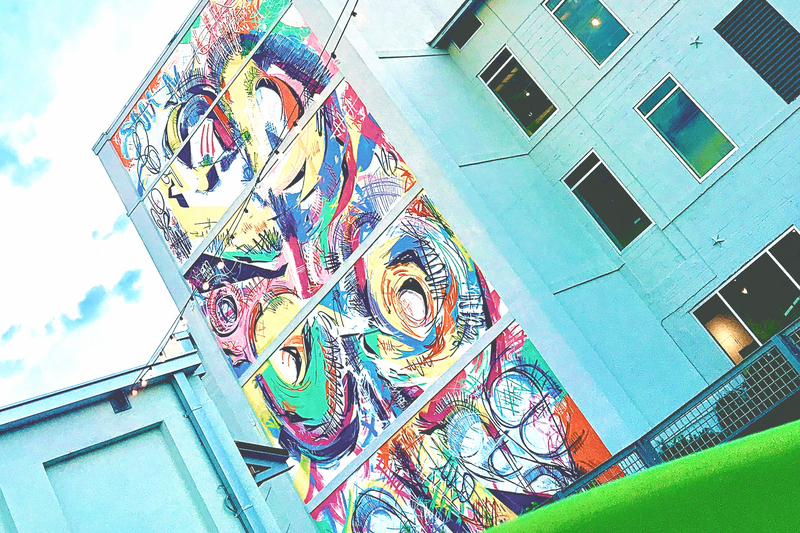 The mural is a beautiful 4-story burst of swirling colors and vibrant energy. Local artist Matt Hebermehl is the brains behind it. It's easiest to photograph in the early evening when classes aren't in session. Nearby string lights also add a nice ambiance in the evening! NOTE: Parking on SCAD property may put you at risk for a fine if you aren't a SCAD student with a school parking permit. Consider the immediate area relatively safe since SCAD security patrols regularly. 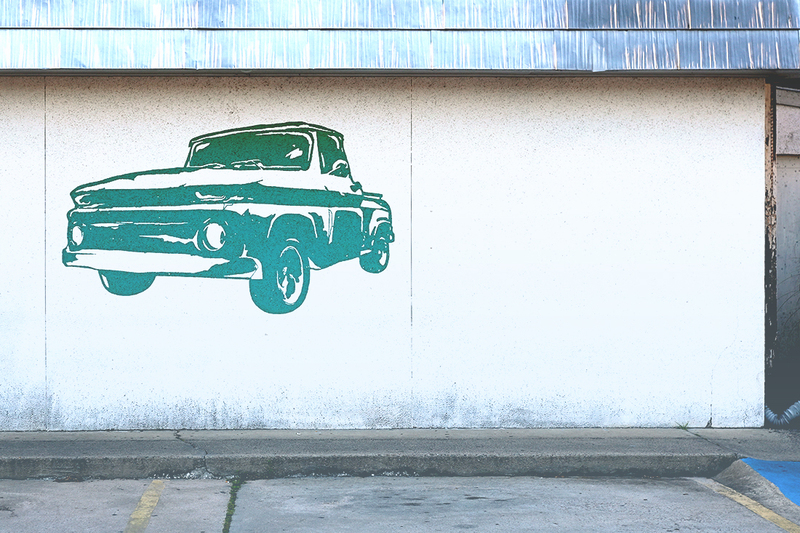 Green Truck | 2430 Habersham Street, Savannah, GA 31401 – This nostalgic mural is painted on the side of Green Truck Neighborhood Pub. It may be difficult to get a clear shot if the restaurant is busy — which it usually is. Be sure to grab a bite to eat while you're there! The burgers are incredible, and you can't go wrong with any option on the menu. Locals have voted Green Truck's burgers as “Best of Savannah” for the past 7 years running [2011 – 2017]. Items are sourced locally and this is the place to go for farm-to-table fare and incredible veggie burgers. Learn more here. Planning a trip to Savannah? 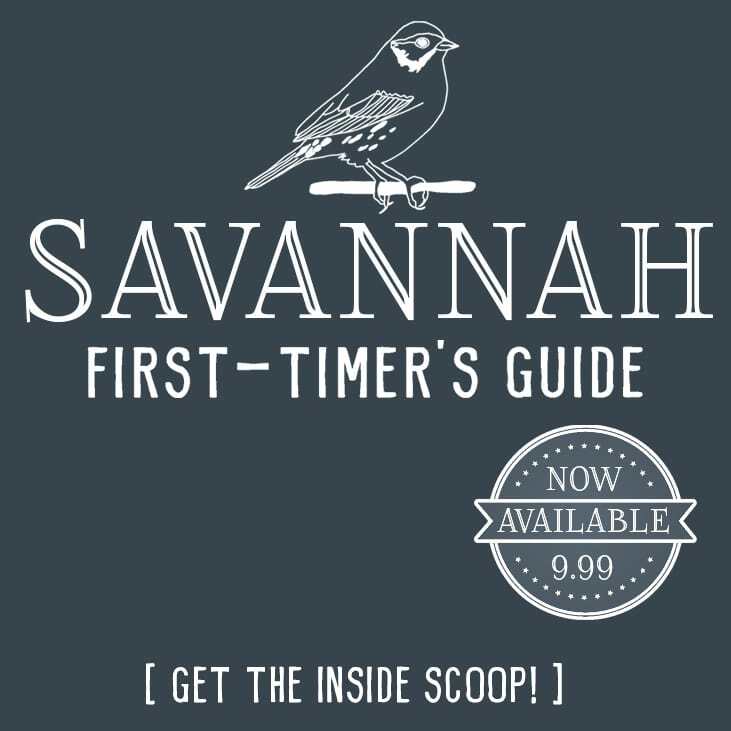 Grab a copy of my Savannah First-Timer's Guide to get the inside scoop on everything you need to know! 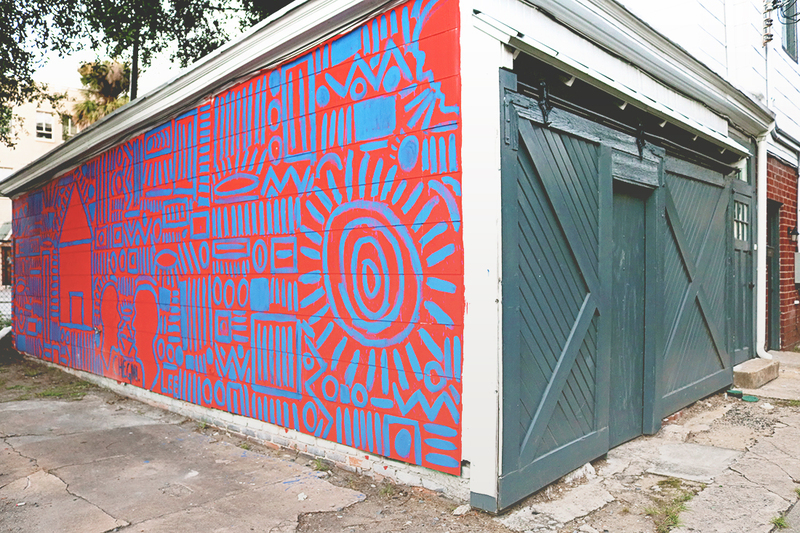 SAFE Mural | 2217 Bull St, Savannah, GA 31401 – Two SCAD graduates named Tommy May (aka: Tommy Lee) and Brian Chegini created this colorful option. The building was formerly an art gallery, but doesn't appear to be open to the public these days. The parking lot rarely has cars in it, so you'll have no trouble finding a spot at this location! Tommy created the SAFE Collective apparel line, so it seems the mural's name is a derivative of his brand. As with many of the murals in Savannah, this one is also in the Starland District. It's only a short walk from this one to the Georgia Bees mural. NOTE: It's always best to be cautious and alert when exploring the downtown area in any city, but this area is pretty well-trafficked and safe. 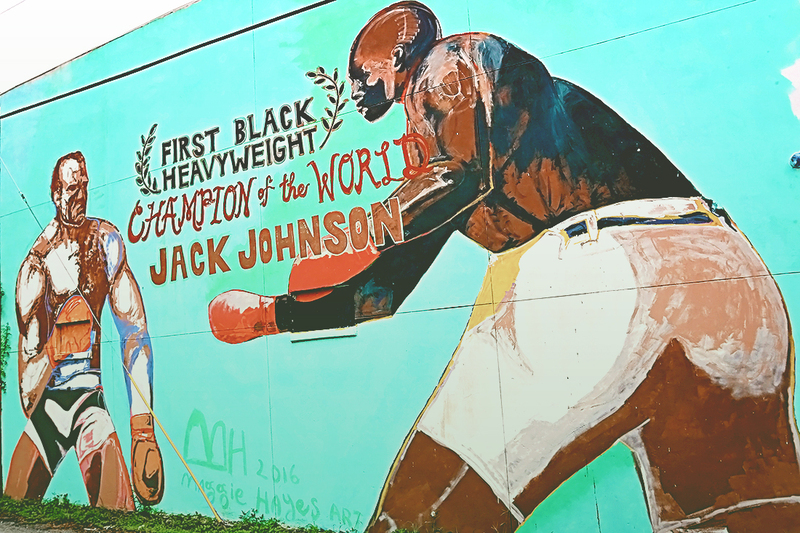 Jack Johnson Mural | 1930 Montgomery Street, Savannah, GA 31401 – Local artist Maggie Hayes created this 2-story mural to celebrate “The First Black Heavyweight Champion of the World”. A straight-on shot is difficult, because there's a telephone pole in the way. You almost need to stand in someone's yard to photograph the mural in its entirety. That's not an option, because the adjacent yard is clearly marked “private property”. Oh well…a side angle will have to do! There's no parking on Montgomery Street, but you can easily find meter-free parking on the side streets. Photograph it in the early morning to avoid Savannah's harsh mid-day sun. NOTE: Montgomery runs parallel to MLK, and neither is known for being a particularly “safe” area for tourists. Go during the morning commute, since Montgomery is well-traveled at that time. Revolution Yoga Studio | 204 W Victory Drive, Savannah, GA 31405 – Created by Jose Ray, this little gem adds a pop of color to a very busy street in Midtown Savannah. The mural wraps three walls of the building and extends two stories high. This location previously housed a fabric studio, but the interior is currently home to a very popular yoga studio. Park in the lot (if it isn't full) or on one of the side streets. NOTE: A few of the nearby streets are very questionable at night, but Victory is so busy during the day that you should feel perfectly safe. Just remember to lock your car. Corner of 41st & Bull | This one's located at the corner of 41st & Bull Street (obviously) in the funky old Starland Dairy building. It was abandoned for many years and is missing its roof, but it's currently being revamped into a fun gathering place for the community. 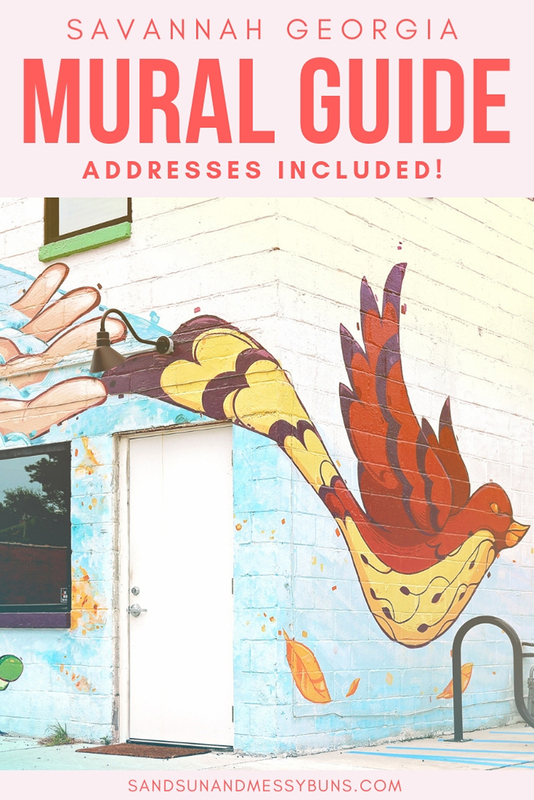 There are multiple murals covering both the interior and exterior walls of the building, but the one above is one of the most colorful exterior options. Here are a few more murals you may want to check out while you're in town. The Blue Door Angel Wings one is very easy to access and is a good one for Instagrammers. 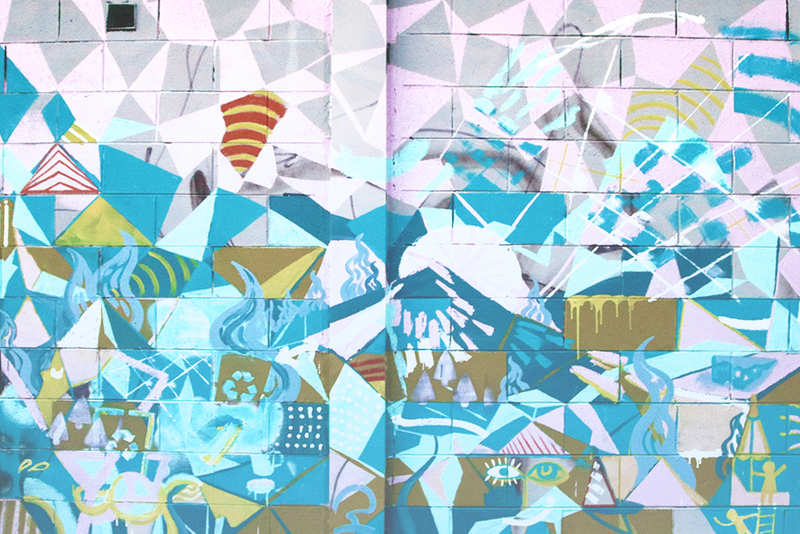 40 Space Mural | This one is by artist Jose Ray and you can see a photo on his site. Miracle on 34th Street is currently blocked by too much junk to get a decent shot, so I suggest putting that one last on your list. Are there any murals in Savannah you'd add to the list? Do you have a favorite out of the ones pictured above? Let me know in the comments! Gorgeous murals! I know there’s a big art school in Savannah. Are these murals from the art students or is Savannah in generally an artsy place? Kind of reminds me of Philly’s murals btw! My daughter attends the art school! It’s called Savannah College of Art & Design (SCAD). The Montgomery Hall mural is by a SCAD student and was commissioned by SCAD. The Starland District is the true “artsy” area (think starving artist types), but all of Savannah is full of incredible museums and galleries! You’ll have to let me know if you make it! We’ll actually be in your area in a few months and can’t wait to see NYC for the first time! Too bad we can’t house swap! Wow so many beautiful murals! I Especially love the one with the bees 😀 Would never have thought places like this existed in Savannah. Wish we had some more colorful places like this where I live in Norway! It’s definitely not the image people usually call to mind when they think of Savannah, but there are some very artsy areas in town! I love that bee mural!! Thanks for including some nearby attractions, it’s great knowing what else is around to check out if I’m already there! You’re welcome. The bee mural has some really cool shops right across the street from it, and the bakery is one of my favorites in all of Savannah! Savannah is on my short list for nomad homes coming up, saving this post for when I go there. I love the Savannah Bees mural. One of my fave things to do in a new place is to wander around and check out the architecture and street art/murals, I’m going to enjoy exploring Savannah! I think it’s a pretty safe bet to say you’ll LOVE exploring Savannah. I never tire of it! If you like architecture, Jonathan Stalcup’s Architectural Tours of Savannah walk is a MUST. I would never have thought there would be great street art in Savannah. I like them all, but the bees is my favourite. Thanks for including the safety tips. I’m also a solo traveler, and always try to aware of how safe a neighbourhood is before I venture in. When do you think is the best time of the year to visit? You’re welcome. You do have to be careful about safety when you’re in certain areas of Savannah. If you’re going to be in town, just message me and I’ll tell you the areas to avoid. October is a fantastic time to visit and I also love the last week in Feb (the flowers begin blooming then) as well as anytime March – May. March is the most expensive time to visit. Love the Pepsi mural! I always look for awesome street art when I travel. This is so helpful, especially since you included the addresses. The Pepsi one is adorable! I recently met someone from Florida who visited Savannah and took pics at that mural after seeing it here 🙂 So fun! These are so cool! I think the SAFE mural might be my favourite. Love tracking down a bit of street art wherever I go, so I’m definitely saving this for later! Thanks for sharing so much detail and the addresses! Super handy. These are all so pretty! I’ve been to Atlanta twice, but haven’t ventured past there. I might have to stop by Savannah just for these photos! The Pepsi mural would be my kind of mural lol I love Pepsi. These are all pretty though. I’ve always wanted to visit Savannah, Georgia. I love the SCAD mural! So colorful and fun! I hope you get to visit soon! (Well, not too soon bc it’s miserably hot in the summertime — but definitely try to come in October or beyond!) The SCAD one is amazing to see in person.